This pie is a homely little dessert. 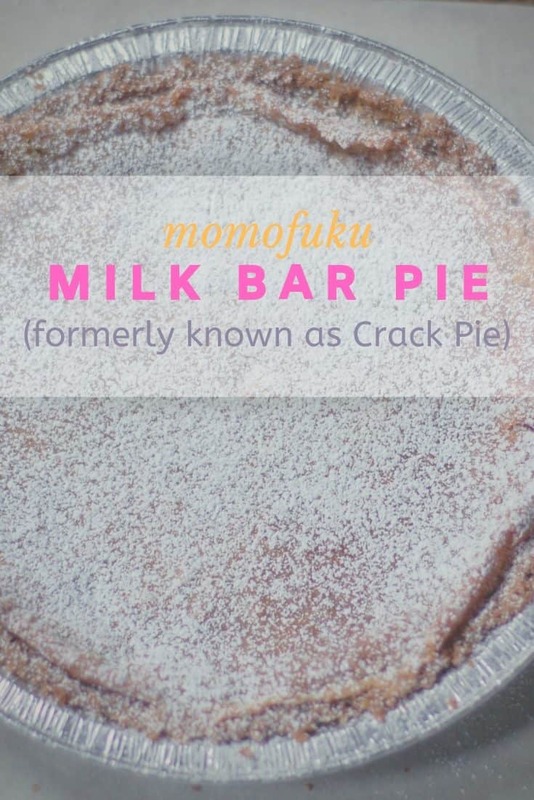 It’s since been renamed simply Milk Bar Pie, which is a fine name for a pie that’s come to be synonymous with Momofuku Milk Bar itself. 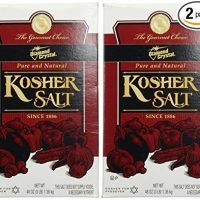 It is rich and sweet and salty and addictive. It’s a pie for the sweet-toothed who like a generous dose of salt in their desserts. It has enough sugar to bring on a high and crash. So slice it into slivers, and proceed with caution. It’s another one from Christina Tosi’s Momofuku Milk Bar, which inspired this cake and this tart. This time, though, I played it straight and pretty much followed the original recipe. I’ve seen a few versions of this recipe floating around the internet that differ from the one in the book in two significant ways. First, they omit the corn powder, which is probably not such a big deal. I assume someone somewhere along the line decided to leave it out because it seems like a strange ingredient for the home cook, but really, it’s not so hard to find. All you need is freeze-dried corn (which I’ve seen at Whole Foods and the Spice House and at local health-food stores and on Amazon) and a food processor or coffee grinder or a blender. 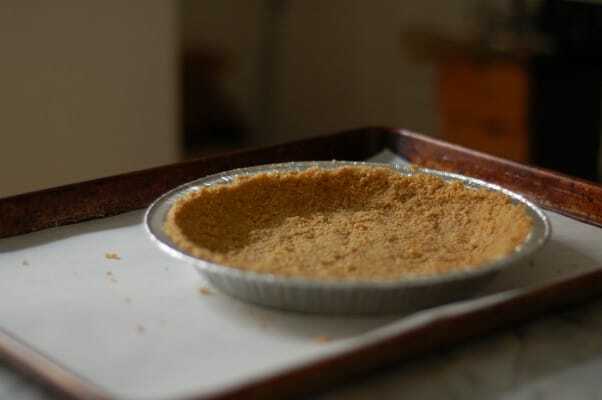 The corn powder helps to round out the flavor and firm up the texture, but you can leave it out and leave all the firming up to the milk powder and have a good crack pie. 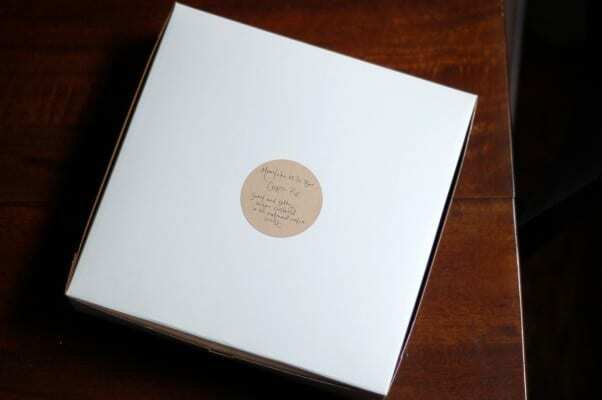 Second, they neglect to instruct you to freeze the pie for at least 3 hours or overnight, which Tosi says they always do at the bakery and is crucial to achieving the dense, rich texture that’s one of the key reasons this pie is so good. In my opinion, the corn powder is optional, but the freezing is not. 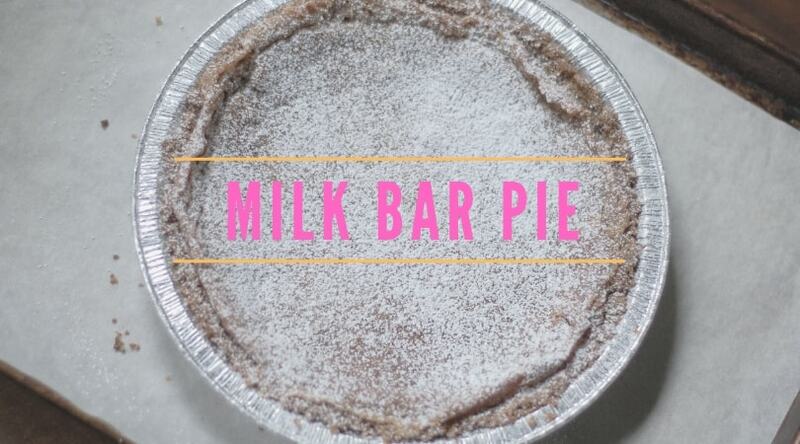 This pie is pretty easy to make, even if some of the steps are unconventional. The crust is essentially a big oatmeal cookie that gets zizzed in a food processor and mixed with a little extra brown sugar and butter and salt and patted into a pie tin. I had to exercise some restraint to refrain from eating the oatmeal cookie part all by itself. The filling needs to be made in a stand mixer. Tosi says this is essential to getting a smooth, dense, gooey texture at the end. Making the filling is a simple matter of mixing the sugars and the milk powder and the corn powder and the salt followed by the butter, followed by the cream and vanilla extract, followed by the egg yolks for a couple of minutes at each step. When this pie comes out of the oven, it looks hopelessly sunken and all kinds of wrong, a flat beige disk with a shiny top and wrinkled edges. But stick with it. 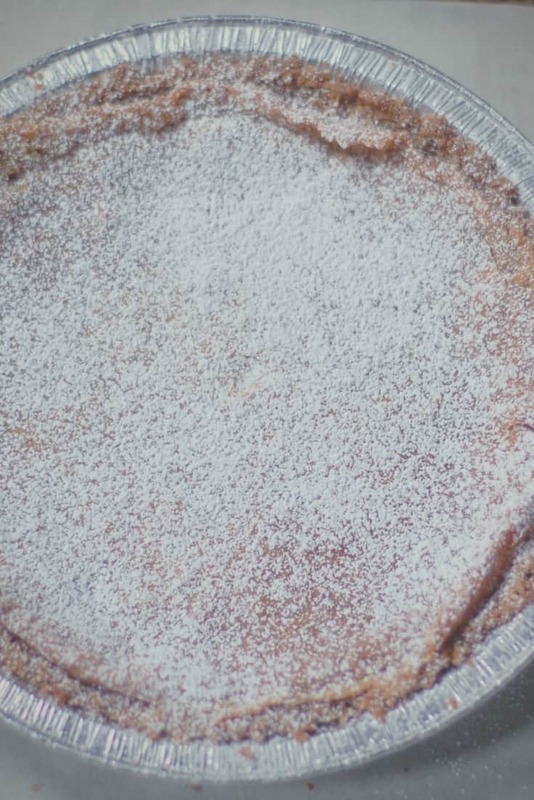 After it cools completely, after it spends the night in the freezer and the morning in the refrigerator, after it gets sprinkled with confectioners’ sugar, this unassuming pie lives up to the hype. It’s sugary, oat-y, salty and so freakin’ good. 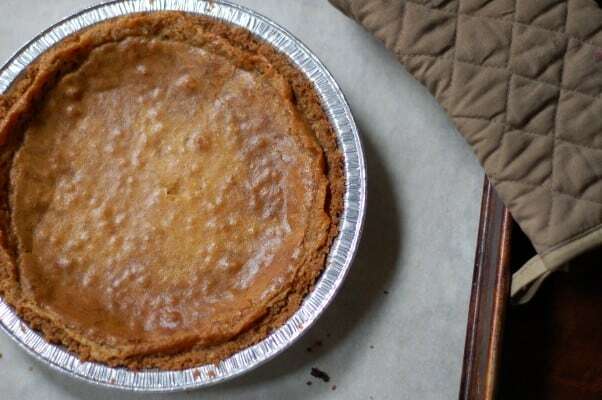 This is a sugar custard pie, a descendant of the old Southern category of chess pies. It’s something like pecan pie without the pecans. Yet it’s got that oatmeal cookie crust and a generous sprinkle of salt that make it a whole different beast. The corn powder is simply freeze-dried corn that has been pulverized in a food processor. 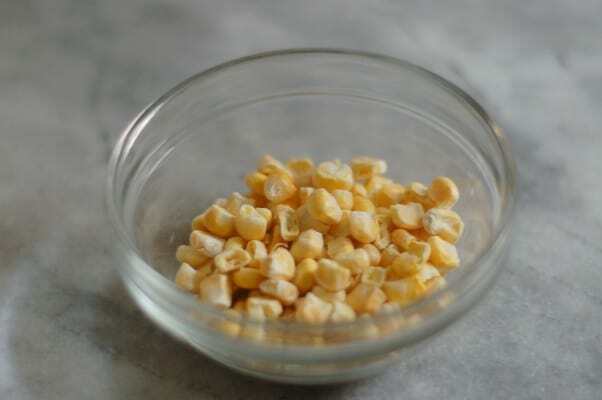 You can find the freeze-dried corn at natural food stores like Whole Foods or online. You can also omit the corn powder if you’d prefer. But don’t skip the freezing step–it’s key to creating the dense, rich texture that makes this pie so good. 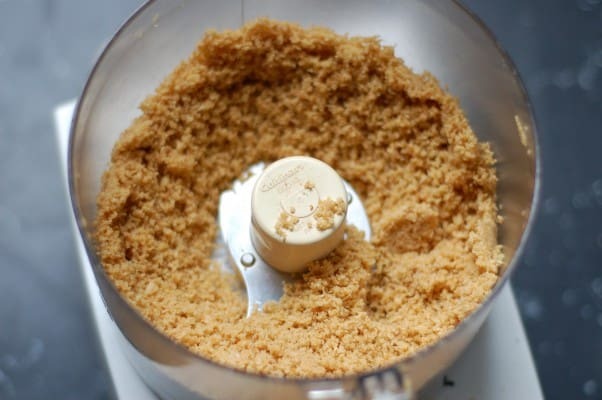 Make the oatmeal cookie crust. Preheat oven to 350°F. Line a sheet pan with parchment paper. 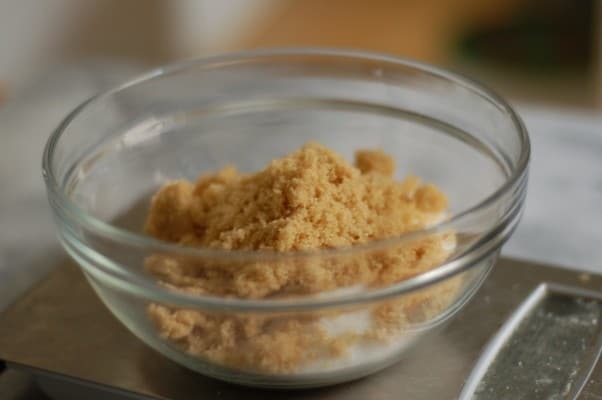 Combine 57 grams (4 tablespoons) of the butter, 38 grams (2½ tablespoons) brown sugar, and the granulated sugar in the bowl of a stand mixer fitted with the paddle attachment and cream together on medium-high until the mixture looks fluffy and pale yellow, about 2-3 minutes. Scrape down the sides of the bowl, add the egg yolk, and mix on medium speed until the sugar granules dissolve and the mixture looks very pale (closer to white than yellow), about 2 minutes. 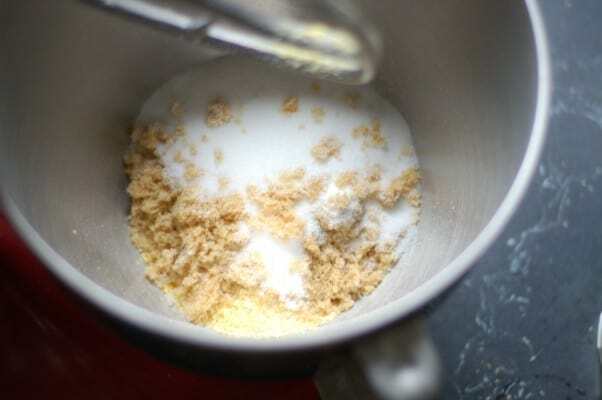 Turn the mixer to low speed, and add the flour, oats, baking powder, baking soda, and 1 gram (¼ teaspoon) salt. Mix just until the dry ingredients are fully incorporated, about 1-2 minutes. 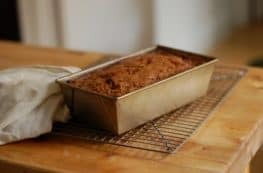 Dump the mixture onto your parchment lined sheet pan and flatten it out with your hands until it’s about ¼ inch thick. 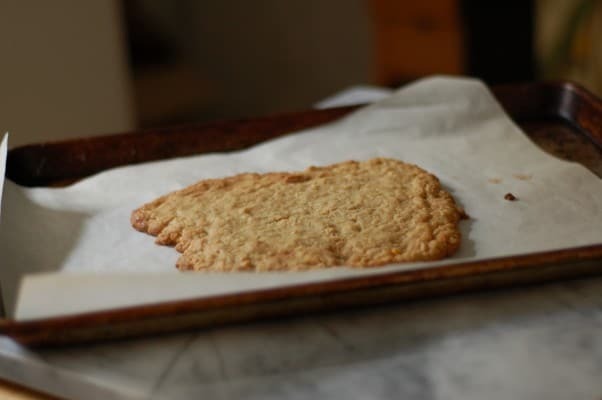 It won’t come close to filling the sheet pan, and it’s fine if it’s an irregular shape as long as the depth is mostly even (you’re basically making one very large oatmeal cookie). Bake until golden brown at the edges and set in the middle, about 15 minutes. Cool completely. 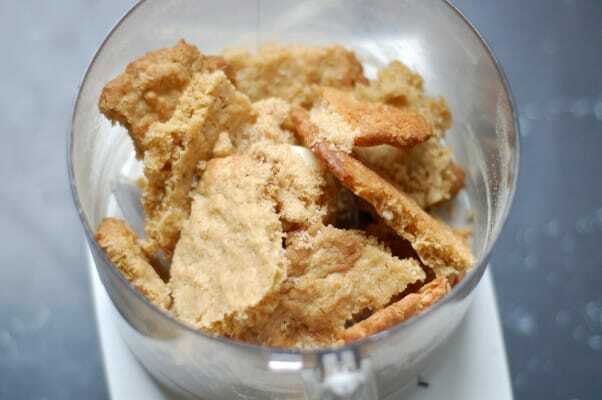 When the cookie is cool, break it into pieces and add them to the bowl of a food processor. 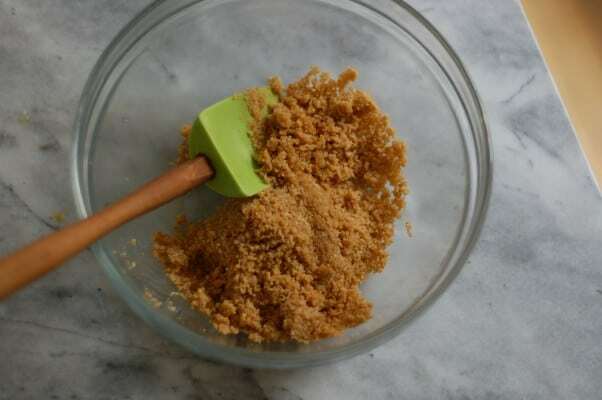 Add the remaining brown sugar and salt and pulse until the mixture is broken down into fine crumbs. Melt the remaining 27 grams (2 tablespoons) butter. 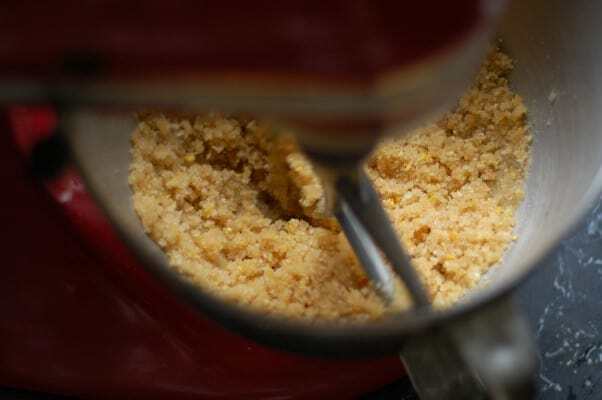 Transfer the crumbs to a small mixing bowl and add the butter and mix until you can form the mixture into a ball. Press the mixture evenly along the bottom and up the sides of your pie tin and place on a sheet pan. 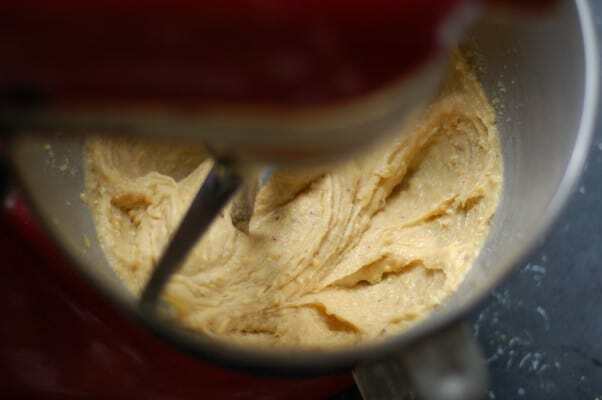 In the bowl of a stand mixer fitted with a paddle attachment, add the both kinds of sugar, the milk powder, corn powder (if using) and salt and mix on low until combined. Add the melted butter and mix on low speed until the dry ingredients are moistened, about 2-3 minutes. Add the heavy cream and vanilla, and mix on low for another 2-3 minutes, or until the mixture looks homogenous with no streaks of cream remaining. Scrape down the sides of the bowl. Add the egg yolks, and mix on low speed for another 2-3 minutes or until the mixture is glossy and thoroughly combined. 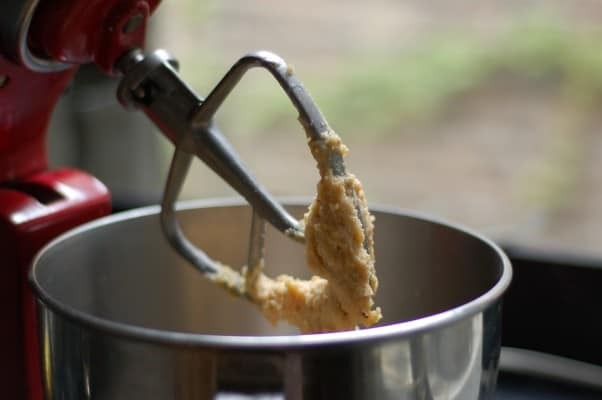 You don’t want to aerate the mixture–this is supposed to be dense, so keep the speed as low as your mixer will go and stop mixing as soon as the yolks have completely disappeared and the mixture looks homogenous. Spread the filling over the crust, and bake for 15 minutes. Open the oven door and reduce the temperature to 325°F. Keep an eye on the temperature (if you have an oven thermometer or an oven that notifies you of its temperature) and when it reaches 325°F, close the door and bake the pie for an additional 10 minutes (if you don’t have a precise way of monitoring your oven temperature, leave the oven door open for about 5 minutes and then shut it and bake 10 minutes). The pie should still jiggle in the middle, but look mostly set around the edges. If it still jiggles at the edges, bake for another 3-5 minutes. Transfer the pie to a wire rack to cool to room temperature. Then freeze it for at least 3 hours or overnight. (Well wrapped, the pie will keep for 5 days in the refrigerator or for a month in the freezer.) Transfer the pie to the refrigerator at least 1 hour before serving. Sift confectioners’ sugar over the top of the pie. Serve in small slices. Store any leftovers in the refrigerator. Hello, what kind of foil do you use to cover the pie in the freezer? Will the moisture not condense and drip on the pie? Teddie, I just use standard aluminum foil. I’ve never had a problem with condensation with this pie. Do you think making these in a cupcake pan? I’d like to give them as little Christmas treat gifts to my coworkers. Do you think it would turn out the same if I adjust the baking time? Thanks! I think you could make them in a cupcake pan, but they might be a pain to get out. 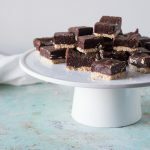 I also think you could make it in a square 8×8 pan and cut them like a bar cookie–the filling is pretty stable. I haven’t tested these that way, so I’m not totally sure. Let me know how it turns out! Wow this is so creative! 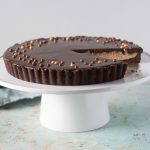 I’ve never heard of a pie like this, so cool and interesting to use the freeze dried corn! That looks amazingly delicious. I definitely wouldn’t be able to stop at one slice. I am such a neurotic baker just reading this post made me sweat. However, I feel I could manage the crust and would probably be totally happy just munching away on that. Sounds delicious. And if you want to come over and make me one I would NOT say no. I’ll get the crust started just in case…. Yum! I have seen this floating around, but haven’t actually tried it yet. Definitely need to with all those incredible flavors! I made this pie (x3) to the exact specifications from the book last Christmas. Not a crumb left over. It’s a lot of ingredients and a bit time consuming, but man is it worth it!!! I’ve made this on two occasions and while they both tasted great and were well received, the filling never really set. I froze them and when they come out they’re fine, but if left sitting on the counter for a few minutes, they’re reduced to a gooey, liquid, albeit still delicious, mess. I’m pretty sure I had them in the oven much longer than was given in the recipe because they wouldn’t set. Would leaving it longer help? Hmm, I’m not sure what’s going wrong. In my experience, the filling stays very dense–gooey but sliceable. If you’re following the recipe exactly, they probably need more time in the oven. This recipe seems so tedious but I really want to give it a try! 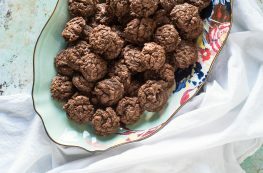 I’m interested to hear your thoughts on crumbling up pre-existing oatmeal cookies and making them into a crust…I’m just super lazy to have to do all of this work! Thoughts?